Here’s the WIDTH chapter from Roads Were Not Built For Cars. Every word has been retained from the paid-for book but the illustrations have been replaced with adverts. The print, Kindle and iPad versions of the book are now widely available thanks to Island Press of Washington, D.C. In due course the full book will be placed online for free, via click-flicky Issuu.com. And by “due course” I mean “eventually” because I’m kind of busy, especially with book tour talks. 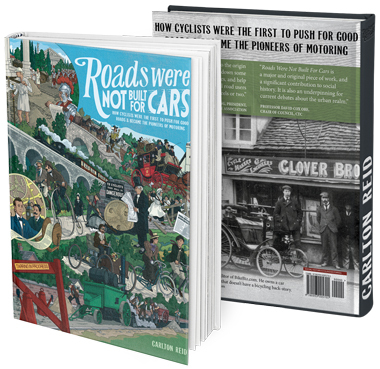 There have been other chapters placed online already, including SPEED, WHO OWNS THE ROADS, and PIONEERS.